There's an art to selecting books for baby storytime. Ideal baby storytime books have large, clear pictures for everyone to see. They have simple text with bonus points for strong rhythm and/or rhymes. They may explore a regular part of baby's life like bathtime, getting dressed, or bedtime. They may include animal sounds or rhyming words or be books that can be sung. They hopefully include great vocabulary since reading books is a great way to introduce kids (and adults) of all ages to new words. But what do you do when you find a great book that's just too long to read in baby (or any age) storytime? You shorten it, of course! You're modeling to parents that you don't have to read every single page or word in a book for it to "count as reading". It's much more important for reading time to be engaging and fun for kids and adults than it is for reading time to last a long time (or even a certain amount of time). Another way to say this is that you're validating that babies may not have the attention span to sit and listen to even one book and that's okay. You're illustrating that we, as librarians, know what we're doing. We know that babies don't have the attention span to sit still and listen for very long (if at all!). We can choose books or alter books to be developmentally appropriate for the age we have in our storytimes. Yay for early literacy professionals! So... how do you shorten a book to use it in storytime? First, get familiar with the book. Take note of which parts will work for your storytime and which parts are maybe too wordy or too slow or don't have natural ways to invite participation. Then, plan how you will shorten it. Paperclipping pages together is a great way to skip some pages without fumbling to find the right pages. Physically skipping/turning pages might give you an opening for a message to parents: "This book is a little long, so I'm not going to read every page. That makes it just right for our babies! The most important thing is that reading together should be a fun time." If you're reading a book to preschoolers, they will notice when you skip a page (especially if it's a book they know). I'd recommend telling them beforehand that you're going to skip a few pages to make the book short enough for storytime. Tell them that if they want to read every word, they can check out the book and take it home after the program! You may not want to skip any pages, but you may paraphrase some of the words on the page. Practice what you'll say beforehand if you're a little unsure about doing it on the fly. You may want to use a post-it note to mark where you want to start reading. Or you may want to skip the words altogether and talk about the pictures you see. All of that is valid reading, both for storytime and for parents with their children. Especially at very young ages, it's more important that we're talking with babies and engaging them than that we're reading every printed word. Here's an example of a book I shortened for baby storytime recently. Dini Dinosaur by Karen Beaumont (Greenwillow, 2012) has fun, colorful pictures and a strong rhythm and rhyme, but it's just a little wordy for the babies. 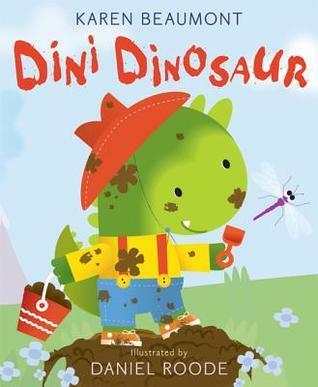 Instead of reading the first few spreads, I showed everyone the cover and we talked about how Dini Dinosaur was playing in the mud and got so dirty. Then I skipped straight to the bath pages. As I read each spread, I ask everyone to find their own body parts as Dini is washing his - feet, legs, tummy, head. Then I just read two more spreads after that, ending with everyone giving a nice tickle to end our story. Using techniques to shorten books to fit your storytime audience's developmental needs is a way to expand your storytime repertoire and expose your library families to even more great books! If one of the books you share sparks a child's interest, their caregiver might want to check out that book to use at home. They might talk about the pictures or they might discover all the words that are just right for one-on-one reading but weren't right for your large group in storytime. Which titles have you shortened or altered to use in your storytimes? How did you do it?